It seems Samsung is sticking to its recent promise of rolling out the Nougat update on January 17th, as owners of the Galaxy S7 edge (and likely the Galaxy S7) in China and the UK are seeing a 1.2GB update on their handsets. The news comes from XDA, and it looks like the regular rollout for non-beta users has now begun. The January 17th estimate was given for the European market, so it’s possible that Samsung will be making the update globally available in a matter of days. For those who participated in the beta program, the final update doesn’t bring anything new, but for everyone else there are a lot of new features in Android 7.0 Nougat. Have you received the update on your S7 or S7 edge? Do let us know if you have, and whether you see something new or different that we might not already be aware of. 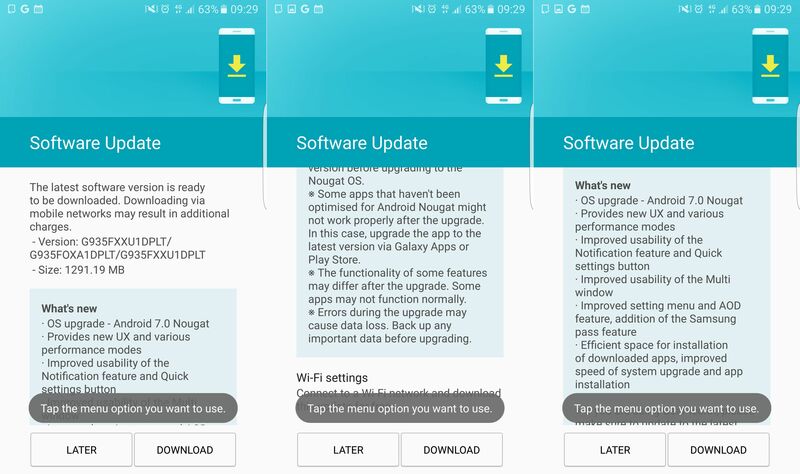 Update: We can confirm that the update is indeed rolling out, as one of our Galaxy S7 edge’s has started receiving the update. At this time, it seems the update is only available in markets where Samsung had launched the beta program, so we’ll be hoping the company doesn’t make consumers in other regions wait too long. Can I install the g930f rom in a g930p model? Sprint its taking so long for the nougat update. Para cuándo Nougat S7 modelo TTT???? Qué desesperante!!! Si te refieres al de T-mobile creo que desde ayer liberaron la actualización oficial. I Can install Android 7.0 UK while he comes from Switzerland ? I bay on phone operator Swisscom he has user experience this operator, it’s possible ? In Portugal no nougat…..S7 edge…..I can’t understand Samsung policy to liberate the update…… in the UK they have the update wy the rest of the Europe must wait so mutch???? É sempre a mesma merda … o tuga paga mais e espera pra último !! I’m so done with with samsung..after switching out my note 7 for the edge 7..then having to wait forever for them to roll out an update ! !God help me but I’m seriously gonna start looking at the iphone..uggh. My last samsung phone . Still no update in France . Update for Vodafone UK on January 23, so probably the French unlocked S7 will be sooner. Anyone know when UAE usually falls in the list? Are they usually late? Trying to decide if it’s worth it to flash BTU…. Usually it takes a couple of weeks. I personally couldn’t wait for it.. I have UAE CSC phone and I flashed it with the BTU.. one word.. totally worth it !! Yeah, I’ll flash it tonight. Was considering switching to BTU anyway. I don’t think you lose anything that I have found. Sure it will be nice if they give us an rollout plan and I have no problem with a little delay for each country but this strategy is very bad 🙁 so still waiting…. I think as usual some countries have to wait a month longer than other ones. Every security update for dbt was released very late in the past. Still XEO from Poland is waiting. Observed the following. Cannot introduce words in fields cuz text keeps overwriting. A lot of bugs in menu. Under bluethoot i get data usage. No all aps on homescreen function? Have you flashed every File? Same happend to my because i only flashed the AP File…i reflashed with every file (Full Wipe) now everything works perfect. The update hasn’t slowed my S7 Edge down, however it has removed the very useful My Places feature. No idea why they’d do this. I hope it gets reinstated ASAP. I loved that feature too. release date for other countries ?? In Germany NOTHING…….. Some other countries recieved it “officiually”?